Opposite Side - only $1 extra! Commemorate the 6 month milestone with a colorful and stretchy BLUE Recovery Wristband! 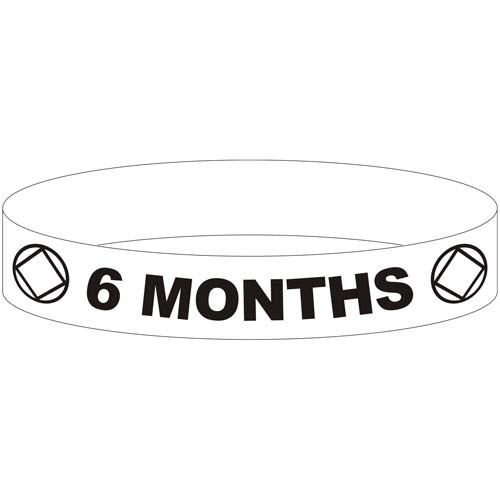 Our familiar Circle and Diamond symbols along with "6 MONTHS" is expertly lasered into these blue silicone wristbands and guaranteed to make the 6 month mark a special one for anyone in recovery! We'll even engrave your homegroup name or a special message on the reverse side for just $1.00 extra! Reverse Side Options: Approx. 20 characters max, please. Note: Your wristband may arrive with some "laser dust" still visible in the engraving. This actually makes the engraving stand out quite a bit. Over time and with repeated washings, this dust will begin to dissipate and your wrist band will take on the classic debossed wristband appearance. Look for our special NA Group Package Deal, too!